A Family SET of 3. 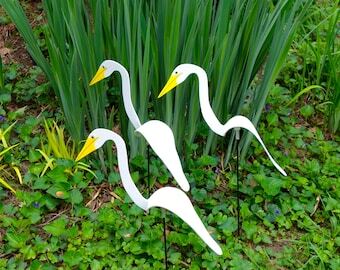 One large swirling bird and two white spinning birdies.They add whimsy to the garden with the slightest garden breezes. PAIR of PINK Flamingo Swirling Birds! 3 pink shades to choose from. NEW Hot pink, Flamingo pink or Pastel. Whimsical kinetic garden art. Swirling Birds in 9 vibrant colors, select your favorite color. They twirl around and bob up and down with the slightest garden breeze. PAIR of White Swirling Birds. 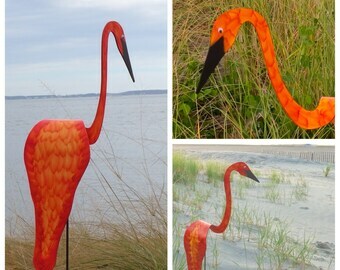 Two whimsical kinetic PVC birds that swirl and bob up and down with the slightest breeze. Announcement FREE SHIPPING on orders $140.00 or more! SAVE $$ with the Sets, Pairs and Trios. 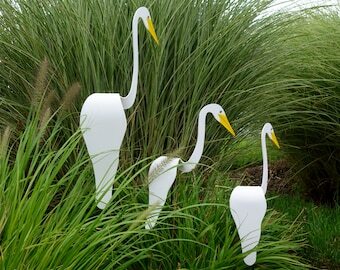 Swirling Birds, a charming and entertaining addition to any garden décor. Likely to attract attention as they swirl and bob up and down with the slightest breeze. 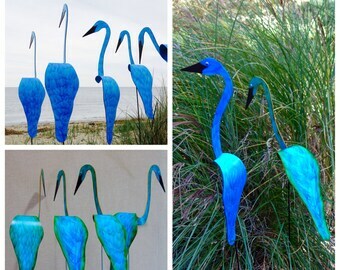 Hand-crafted garden art created in the likeness of egrets, herons, and flamingos. FREE SHIPPING on orders $140.00 or more! SAVE $$ with the Sets, Pairs and Trios. White Swirling Bird, our original design! Whimsical kinetic art for the garden. They twirl and bob up and down with the slightest breeze. 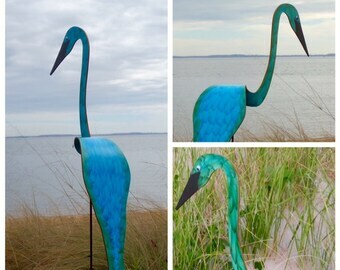 Our Flamingo in 3 shades of PINK! 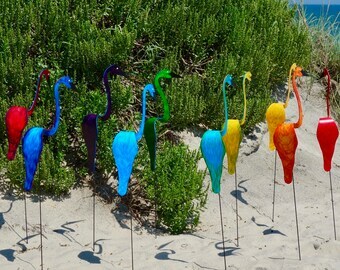 Select your favorite.A whimsical addition to any garden as they swirl and bob up and down with the breeze. Matched Sets in color. One Swirling Bird & one smaller sized Spinner in our signature hues. A delightful kinetic duo for your garden décor. TRIO of the Favorites! One White Egret and Two Flamingos. They bob up and down and swirl around with the breeze. 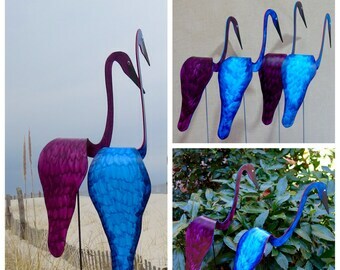 Swirling Birds in Blue Violet Feather designs in royal & iris blue tones. Our kinetic birds swirl with the slightest breeze. Swirling Birds in Dazzling Orange-Apricot feather designs. Our hand-painted kinetic birds swirl with the slightest breeze. Swirling Birds in Peacock Blue-Green Feather designs. 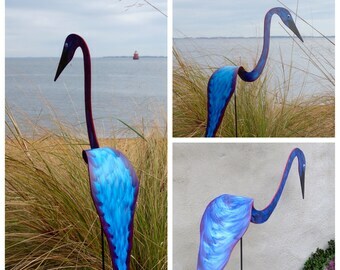 Our kinetic birds swirl with the slightest breeze. Cool Blue Families of 3! One swirling bird with 2 smaller sized spinners. Select your favorite colorful kinetic set. Flamingo Family SET of 3 in Flamingo Pink or Hot Pink. Bring the tropics to any garden setting with their whimsical kinetic movement. Families of 3 in our warm color palette.One Swirling bird and two smaller sized Spinners.Apricot-orange, golden caramel, and raspberry red. Wind Spinner Sets of 3. Whimsical wind spinners, a trimmed down version of our original design. Choose a set in warm or cool colors. SET of 3 Spinning Birdie Chicks. 3 delightful wind spinners to enliven your garden. They spin easily with the slightest breeze . PAIR of 2 Favorite Swirling Birds garden art. Eye-catching charming movement as they swirl and bob up and down with the slightest breeze. PAIR of Swirling Birds in cool BLUES. Whimsical movement as they swirl and bob up and down with the slightest breeze garden breeze. PAIR of 2 Swirling Birds. Choose the favorite Blue Violet or Deep Purple or one of each! Their twirling kinetic movement will entertain. TRIO of White Swirling Birds. 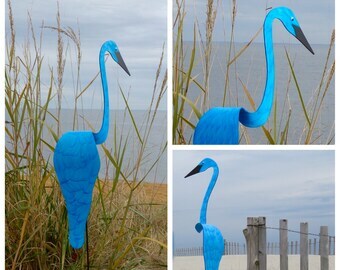 Three whimsical kinetic PVC birds that swirl with the slightest outdoor breeze. SET of 5 White Swirling Birds Special offer! A flock of FIVE whimsical kinetic birds that swirl with the slightest breeze. Beautiful wind spinners...my sister will LOVE them! My second time buying these lovely birds. My parents loved them as an anniversary gift!